OTTAWA - An armoured-vehicle program, once deemed essential to protect soldiers from roadside bombs, is being ditched by the Harper government, say defence and government sources. The $2.1-billion, close-combat vehicle acquisition joins a long list of troubled and failed military procurements. An official announcement is set for Friday, when the country's top military commander is expected to recommend the government not proceed, allowing three private-sector bids to expire by Monday's deadline without selecting a winner. Gen. Tom Lawson is also expected to underscore that the decision is military, not political. Public Works, which oversees the program in the contract stage, referred questions to National Defence on Thursday. A senior government source confirmed the program is dead, a move defence industry sources had already heard early Thursday. The plan to buy 108, 36-tonne vehicles, meant to carry troops but also to fight like a light tank, has been on tenuous ground for months, as the army expressed doubts it could afford the new fleet under the current budget restraints. The army's baseline budget has been slashed by as much as 22 per cent since 2011 and defence sources say it will likely drop by another 10 per cent by the end of next year. National Defence is expected to slash between $2.1 billion and $2.5 billion from its budget by next year without cutting the size of the Forces — something defence experts have warned will mean drastic reductions in training and operations. The cancellation is likely to be met with anger and frustration in the defence industry, especially among the three contractors who've spent millions of dollars since 2009 in two rounds of bidding. The contractors — Nexter, BAE Systems Inc. and General Dynamics Land Systems Inc. — were each required to hand over vehicles for testing, an exercise that included subjecting them to live fire and bombs to test their endurance. The bills stretch into the tens of millions of dollars and there's been rumbling within the defence community of legal action to recover those costs. The government source says the vehicles, ordered years ago, no longer meet the needs of Canada's military. 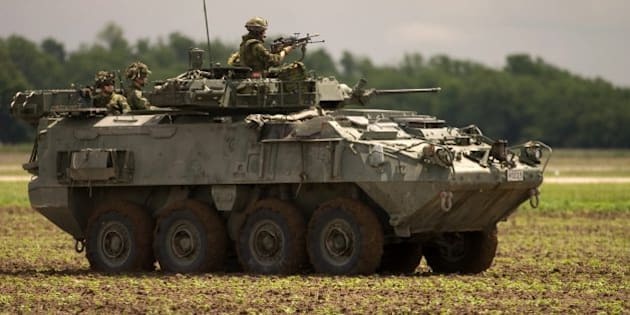 Defence researchers Michael Byers, of the University of British Columbia, and Stewart Webb made the same argument in a report earlier this year, describing the vehicles as a relic suited to the Cold War rather than to the low-intensity conflicts the army is likely to face in future. "Canadian taxpayers have dodged a $2-billion bullet," Byers said Thursday. "This is the right decision, but the fact that it took the government so long does not inspire confidence in the procurement system. If you have a procurement that is failing you have to have to courage to say No." The fact the military can insist it needs a capability and then within the span of four years say it no longer fits the plan speaks to the absence of a clear, coherent defence policy, he added. Byers said other big-ticket purchases, notably the F-35 stealth fighter and the Arctic patrol ships, are similarly not well thought through. Their study, sponsored by the Canadian Centre for Policy Alternatives and the Rideau Institute, said the military can expect to see more Afghanistan-style insurgency wars. The increasing size and power of Taliban roadside bombs initially drove the army to recommend a close-combat vehicle, something with more weight and protection than the army's current fleet of light armoured vehicles. By the end of the war in Kandahar, insurgent fertilizer bombs had become so powerful they routinely pierced the reinforced skin of the LAV III's.